Wow! That was interesting men’s offseason and we haven’t even played a snap. From ONE League with Div 2 fielding 4 teams for development then back to 7 and 7, before we blinked it was 6 (Div 1) and 8 (Div 2) then another team put their hands up to drop. Ultimately GV finally decided to just have a division for all 13 teams (12 clubs). The 2018 Season kicks off on Saturday, August 4th and we can’t wait for it. Last Season – DIV 2, 6th Place. After a promising start to last season going 4-2 and looking like a playoff contender, the Falcons dropped off and missed out on the playoffs entirely. Lack of numbers and key players missing due to work commitments hampered their season but there were shining lights. 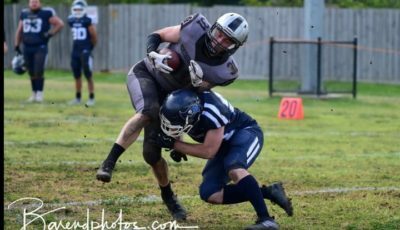 Rookie QB James Stephens had a solid season with WR/FS Eddie Carey, WR/CB Duncan McIntosh and RB/LB Peter McKay selected to the All-Victorian Division 2 side. With the addition of new blood and the return of their core players, we could see a big improvement from the Falcons. A big loss for their special teams is the leg of Punter/Kicker Paul Jones who has left due to work commitments. Someone else besides the above mentioned need to step it up this year, especially with the League restructure. Could be a very tough year for them. Last Season – DIV 2, 5th Place. A big off-season for the boys from Bendigo. Joining forces with Latrobe University and improving their training facilities. The signing of three International playing coaches and getting their own cheerleaders for home games and some away games. With the majority of last years roster returning and an addition of some new faces, we should see a vastly improved Dragons outfit come week 1. Unfortunately there have been a few key losses due to injury, setting their preparation back a little. With the addition of Ian Juede, Tarrence Bell and Michael Dell who have a mix of College and semi professional playing and coaching experience, expect to see a team playoff bound. Juede who played Receiver and RB at Colorado Mesa University will be the starting QB. 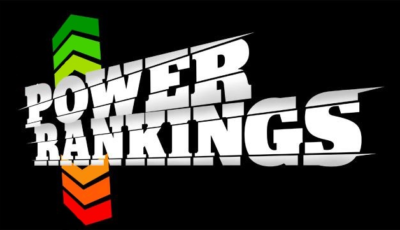 The Import QB should see the demise of fill in QB Thomas Prince, giving him more time to make fun of everyone in his weekly power rankings article (if he’s allowed) or concentrate on his political career and keeping his hair in order. Bell who will play DE and LB played College football at Mayville State University in North Dakota while Dell, who has played Semi Pro Arena Football for the Kansas Sentinels will play DB and LB for the Dragons. Last Season – DIV 1, 4th Place. Three seasons ago this club did what most haven’t been able to do, that’s knock off Monash in a Vic Bowl. Since then they have struggled, mainly due to injuries. With the League structure they will probably win more games than they lose and cement themselves a Playoff spot. League Legend (His words) QB Jamie Stafford has switched positions and will play RB and WR while Vault Studios everywhere man, James Arthur, will return to the Offensive Line. Club great Mark Doyle will pad up again at Safety with ever reliable Liam Fordham joining him. Like most of the bigger clubs the Rangers have got themselves a handy import. Quarterback Brady Keliher who was a High School State Champion and a walk on at Wisconsin. Notable rookies to look out for are FB William Bendle, DB Courtney Holland-Hughes and WR James Fountain. They have also added former Silverback LB Adam Kolinski who has been impressive during pre season. Last Season – DIV 1, 5th Place. Lead by former QB and veteran Daniel Noonan, I still think there is enough talent and experience to win more games than they lose . This team almost knocked off the Warriors in a windy game in Geelong, defeated the Rangers and Melbourne Uni earlier in the season before struggling late in the year. Their Colts team performed well after a slow start and we may see a few of those boys in the Senior side. They open up this season in a brand new club house and playing field which is exciting for all involved. Can they make this a formidable domain or will they find themselves in the middle of the pack? Last Season – DIV 1, 3rd Place VIC BOWL RUNNER UP. 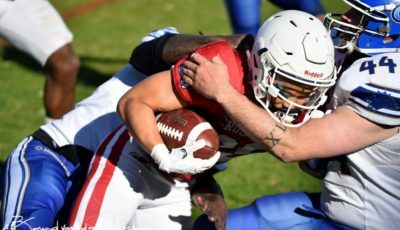 The Royals shocked everyone except themselves with a playoff victory over League powerhouse Monash Warriors. A former DIV 2 side has come a long way since. Their main strength is on the Offensive Line, which was bolstered with Joshua Faure defecting from the Raiders. Whoever the QB is this year I’m sure they will feel safe behind that line. Other former Raiders have come across which will add more experience to the roster. With the Colts team winning the Championship we will see some of those young men in the senior side. Can they take that next step and win a championship? Last Season – DIV 2, 2nd Place CHAMPIONSHIP RUNNER UP. It will be very interesting to see how the club that came agonisingly close to pulling off a stunning 2017 season in their two year existence will perform. Even though they lost to the better prepared Northern Raiders they still managed to keep the Raiders high powered Offense to 10 points for the entire Championship game. 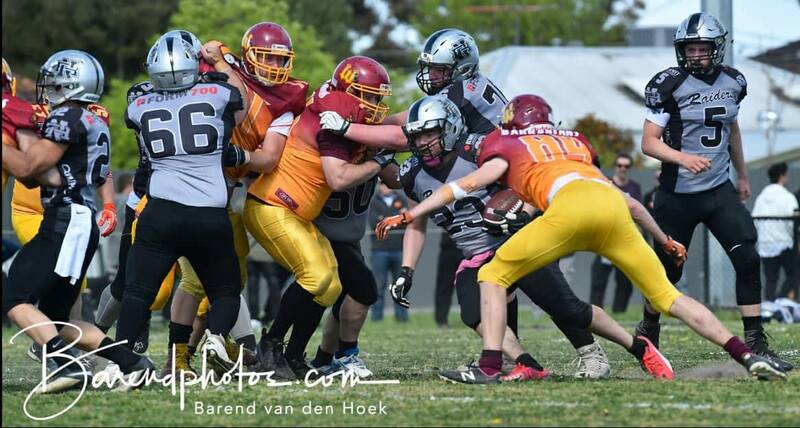 The Offense faltered and their League MVP QB Matthew Krul struggled in the season finale. The Melton boys should be recognised for their hard work the day before the Vic Bowl, preparing the field after the council dumped sand on it otherwise there would have been no games. The Wolves will come into 2018 with a new look and with what is looking like a 55+ man roster. Some serious potential has been added to both sides of the ball and they could find themselves in the playoff hunt in just their 3rd season. They will hope that Krul can use his arm more than his legs this year which will lighten the workload a little for RB’s Thomas Shutt and Jamie Spiteri. In 2017 Rookie sensation WR Daniel Mansueto’s 2nd season, he will look to continue his Reception to TD ratio. This team also prides itself on Defense with well respected DC Paul Grima calling the plays. Last Season – DIV 2, 4th Place. A fairly slow start for Monash who have been accustomed to being at the top in both Divisions but won’t be happening this year. They nearly pulled off a miracle, narrowly losing to the eventual Champion Raiders in their semi final. If it wasn’t for a defensive lapse in the last 2 minutes they would have been playing off for a DIV 2 Championship. Scrambling extraordinaire and Golden boot wearing QB Richard Truong was thrown in at the last minute due to an injury to their starter but he is moving back into the Warriors line up. With a less mobile QB but a more accurate passer, there should be an improvement by the Offense, as long as they can hold onto passes unlike last season. The Offensive line, led by giant Ben Taylor, will need to be strong and consistent. Montell Wickremasinghe will be lining up in the backfield and will be a threat if he stays healthy. The defense will need to improve to compete with the top half of the table. Large player numbers were seen on the first training night with even more rookies. Could this club almost have enough players to form THREE teams? Numbers aren’t everything so they will need every player to play a role and play it well. Last Season – DIV 1, 2nd Place. Prediction – 2nd Place (9-1) VIC BOWL RUNNERS UP. A season full of injuries and it showed. Losing to the Royals in the Playoffs wasn’t something they expected and will look for revenge. Dinosaur Dom Dearman is padding up for his 100th season and with a healthy Luke Jackson in the backfield they should find themselves in the Championship hunt once again. This has been the most dominant club over the last 15 or so seasons and rarely miss a Vic Bowl appearance. Can they get back there this year? A solid season ending with a Championship, how much better can it get? Despite the win we will see a completely different looking Raiders outfit. Victor Utupatu, easily one of the best LB’s in the game has hung up the boots. Dual threat Ben Norton (Ret) also won’t be returning and Joshua Faure has moved to the Royals. Other notable losses are Jamie De Cicco (Ret), Jack Pattison (Royals), Daniel Strangis (Ret), Alex McDonald (Royals) and Buddha Godfrey (Royals). Jesse Spiropoulos returns as does State representative Safety Mark Padula and DL AJ Nonoa, maintaining some stability. With so many changes and a majority of rookies, I expect them to finish in the bottom half of the standings. My biggest concern is player numbers with under 30 registered players. When you are winning it’s not really an issue, as we saw from them last year. Last Season – DIV 2, 7th Place. The Soccer team is no longer and the short lived amalgamation has been scrapped to see the Pakenham Silverbacks regain their original name and identity. Although I did think the Miami Hurricane colours of Orange and Green did look pretty cool. We will only ever see them in Green and Black from this day forward. A season this once powerful club would rather forget after going undefeated and championship winners just one season prior, to dead last with just one victory. It was a very solid victory over their fierce rivals Ballarat in what was better known for it’s after game shenanigans. They have recruited well and some old faces have decided to give it another go. They had the youngest starting QB in Div 2 last year and are in a serious rebuilding phase. They will be fierce once again on defense. I may have them a little underrated but I was informed by the club that it is quite a young side. The first season for this club which usually means a few blowouts and a close victory or possibly two. Learning what it’s all about to play in this League. Don’t expect too much from their first season but I think we can all agree, it’s great to see another club in the competition. The team will consist of mainly rookies (As most new teams do) and players that have taken the field in the past. I wish them all the best in season 2018. Last Season – DIV 1, 6th Place. You have to hand it to them, they elected to remain in DIV 1 all this time and now they have the opportunity to win some more games than previous seasons. Their Colts and JV programs are ones they can be proud of and hopefully that can transfer that success to the Seniors. They managed a few wins last year and look to improve on that. Last Season – DIV 1 (10-0) VIC BOWL CHAMPIONS. Prediction – 1st Place (9-1) VIC BOWL CHAMPIONS. A couple of other big losses occurred during the State AGL games with OL Hayden Brown suffering a broken leg, he will return mid season and DE Lui Toliseli will miss the season with a dislocated knee. 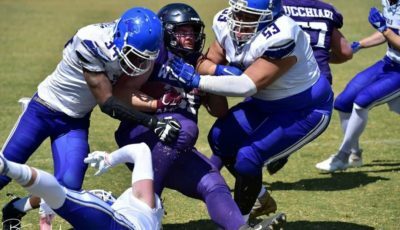 Despite these losses their is enough talent to repeat as Vic Bowl Champions but there is a need “Like most teams we need more big guys” Wilson said. He also states that “this is a rebuild year” while they try and cover their losses. I still think they are the team to beat. Thanks to the following for the information you provided. It’s greatly appreciated. After getting the opportunity to write for Division 2 the last 2 seasons, I now find myself with the massive task of writing about the entire League. As I can’t physically get to go and watch every game that will be played, I rely heavily on people feeding me game information to complete my weekly reviews and game previews. Some clubs are good at doing this while others could probably try a lot harder. So if you are a player, volunteer, coach or committee member or just a fan of the game and wish to help me out with some information, please hit me up at ssditch@yahoo.com or find me on Facebook. Info needed would be players who performed well (Number and Position), Statistics if you have access to any and just a description of what happened.